Unique, coveted, and classic, a Nambé gift makes a statement. To put the finishing touches on your thoughtful expression, we offer gift wrapping for a nominal fee and an optional, complimentary gift message that you may personalize. Well-designed gifts from Nambé come in well-designed packages. 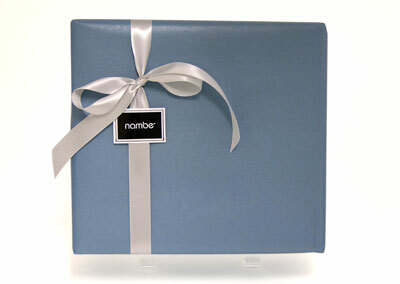 We'll wrap your gift in our signature Nambé blue paper and tie it with a silky silver bow. Simply choose the gift wrap option when you check out. Our team will perfect your gift with our signature wrapping for only $8 per item. When you check out, you will also have the option of adding a personalized note with the name of the recipient, your name, and a personal note. Simply type your message into the gift message box when you check out. We allow up to 250 characters and a maximum of seven lines of text. At this time, we provide the option of one gift message per order. When you identify your item as a gift, we will automatically include a packing slip that excludes prices. Your gift recipient can use this packing slip to exchange the gift item through nambe.com. For more information on exchanging a gift, see Returns. At this time, Nambé does not issue gift cards or gift certificates. If you have a Nambé Gift Card and wish to redeem it, please contact Customer Service for assistance.